This is a summary for Brinley from 5 years 4 months to 5 years 5 months old. Sleep is great with nothing new to report. Eating is normal. She isn’t a picky eater, so we don’t have issues in that area. School is great. She has gotten a strike a couple of times for talking too much…which doesn’t shock me. One day I was doing her hair and commented that she is good at talking. She replied, “No, I just talk a lot.” Yes she does. Each day she got a strike, I told her that she needs to work to not be talking when she shouldn’t be talking. I like her to know I expect her to follow the rules. I know it is hard for a socialite to stop talking…and I know better than anyone how hard it is for Brinley to not talk. She tries hard. 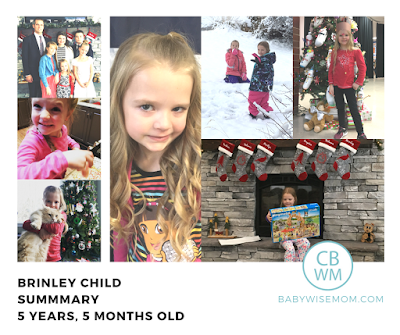 Brinley had a fun winter break, but oh my how we detox after her life has been off-schedule. She loves her routine. She gets super emotional when her routine is off. It isn’t as though she is upset and asking for her routine, she is just the epitome of an emotional person who is weepy and has no idea why. She said a funny thing on her first day back. I asked her if she was excited to go back and see her friends. She said no because she already knows them. If she were going to a class full of people she never met, she would be excited. That made me feel happy about deciding to send her to school this year. Next year, she will have a large group of friends from church who will all go at the same time. I am glad she loves to meet new people because that is what she did this year! We will be starting the musical up soon. This year we are doing The Little Mermaid. Brinley will be a seahorse in the ensemble. She is cracking me up, though, because she keeps talking about how she just isn’t in very many scenes. She loves to perform. Brinley has a hard time letting something drop. If she wants do something, she has a hard time waiting. She has a very hard time with the unknown. When she wants to play with McKenna, she will pester her into submission. I try to require her to wait when it is feasible because she needs to learn how. I don’t know if it is a personality trait or a learned trait from just being the youngest and never having to wait because of a baby. Maybe a perfect storm of both? Swimming lessons: with all the crazy of the holidays, we only had 1-2 lessons this past month, so there is nothing major going on. Gymnastics: she is still scared of heights (I imagine this will be a life fear? ), but she still enjoys gymnastics. Dance: dance is great! She loves her dance teachers. Piano: Piano is great. She reminds me of Brayden when he was in his early days of piano playing, and he LOVES to play the piano. 12:30 PM–home and eat lunch. Homework. Practice piano if we didn’t have time. Then she can watch two shows and has independent playtime if desired. Two days a week she has her extra curricular activities. I scheduled her stuff during the other kids’ school day so we didn’t have our family time so interrupted. 4:00 PM–Siblings home. Sibling play and family time.